One of our most brilliant historians, Tony Judt brings the past century vividly to life in this unprecedented and original history. 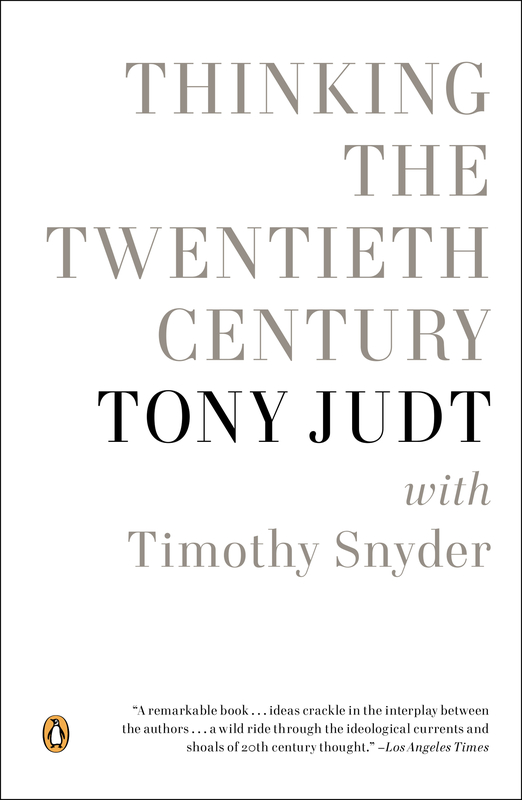 Structured as a series of intimate conversations between Judt and his friend and fellow historian Timothy Snyder, Thinking the Twentieth Century presents the triumphs and the failures of the twentieth century's most prominent intellectuals and their ideas, guiding readers through the debates that defined our world. Spanning an era with unprecedented clarity and insight, Thinking the Twentieth Century is a tour de force: a masterful analysis of the life of the mind and an unforgettable guide to leading the mindful life. “This book is history, biography and ethical treatise. It is a modern history of modern political ideas in Europe and the United States. Its subjects are power and justice, as understood by liberal, socialist, communist, nationalist and fascist intellectuals from the late nineteenth through the early twenty-first century. It is also the intellectual biography of the historian and essayist Tony Judt, born in London in the middle of the twentieth century, just after the cataclysm of the Second World War and the Holocaust, and just as communists were securing power in Eastern Europe. Finally, it is a contemplation of the limitation (and capacity for renewal) of political ideas, and of the moral failures (and duties) of intellectuals in politics. To my mind, Tony Judt is the only person capable of writing such a broad treatment of the politics of ideas. As of 2008, Tony was the author of intense and polemical studies of French history, essays on intellectuals and their engagement, and a magnificent history of Europe since 1945, entitled Postwar. He had allowed his gifts for moralization and for historiography to find distinct outlets in brief reviews and longer scholarly studies, and had brought both forms very close to perfection. This book arose, however, because at a certain point that November I understood that Tony would be incapable of any further writing at all, at lease in the conventional sense. I proposed to Tony that we write a book together the day after I realized that he could no longer use his hands. Tony had been stricken with ALS (amyotrophic lateral sclerosis), a degenerative neurological disorder that brings progressive paralysis and certain and usually rapid death.